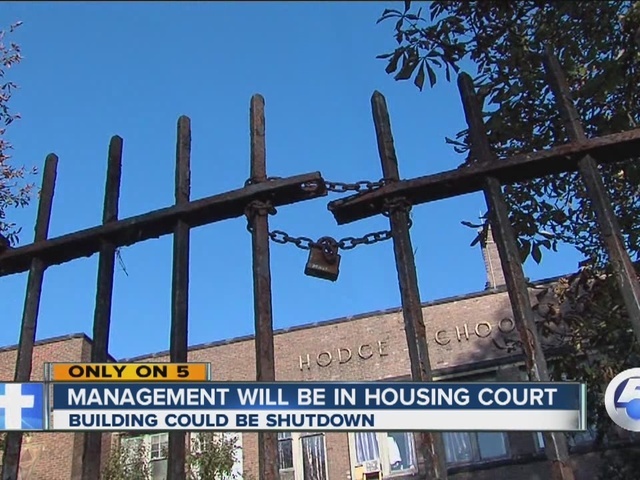 Cleveland residents living in the old Hodge School Apartments on East 74 Street are wondering if they'll soon be forced to move out after a series of code violations were discovered at the complex. Residents contacted newsnet5.com and showed us numerous issues including collapsed floors, missing furnace units, and a series of electrical and plumbing issues. Tenants explained the building has been going downhill for years, and now they're concerned city inspectors will close down the re-purposed old school building. Julian Machala, who is a concert violinist, explained many artists have lived in the loft style apartments over the years, but now current tenants are concerned about safety. "We had a major floor collapse into the laundry room, and part of the building had to be boarded-up," Machala said. "The top ceiling went through the second floor, the second floor went through the first floor, and the debris landed in the basement." Residents let apartment management know newsnet5.com was looking into the case, and now a new team is making major improvements hoping to save the building. New management is scheduled for a hearing in housing court next week, trying to determine what must be done to maintain the building occupancy permit. Many tenants, like Machala, are holding their rent in an escrow account until the building owner makes the needed repairs. "We really like it here, but something must be done about safety," said Machala.